Have you looked at Amazon Web Services and shook your head in dismay and frustration? Well, stop shaking your head and shake my hand instead, because so have I. The documentation is so geeky it froze me solid for several minutes - surely it must be easier than this? I've had customers become so confused that they gave up entirely! Here's what I want you to know: yes, it is a bit geeky. However, getting started is not all that difficult. 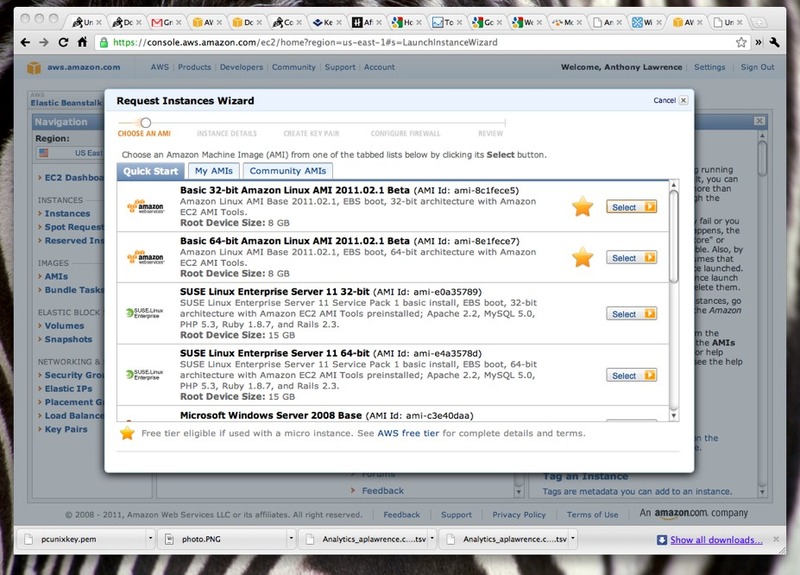 If you can handle getting Apache or any other web server configured and running, you can do this. By the way, I searched in vain for a simple write up that would explain what I needed to do to get started - I never found anything, so this is my gift to you and the world. To help new AWS customers get started in the cloud, AWS is introducing a free usage tier. New AWS customers will be able to run a free Amazon EC2 Micro Instance for a year, while also leveraging a free usage tier for Amazon S3, Amazon Elastic Block Store, Amazon Elastic Load Balancing, and AWS data transfer. AWS's free usage tier can be used for anything you want to run in the cloud: launch new applications, test existing applications in the cloud, or simply gain hands-on experience with AWS. There are some limitations, but they are quite generous - see the link above the quote for details. After the year is up, they estimate that your site would cost about $40 a month - that is very competitive with hosting sites offering comparable services. So, you've signed up. 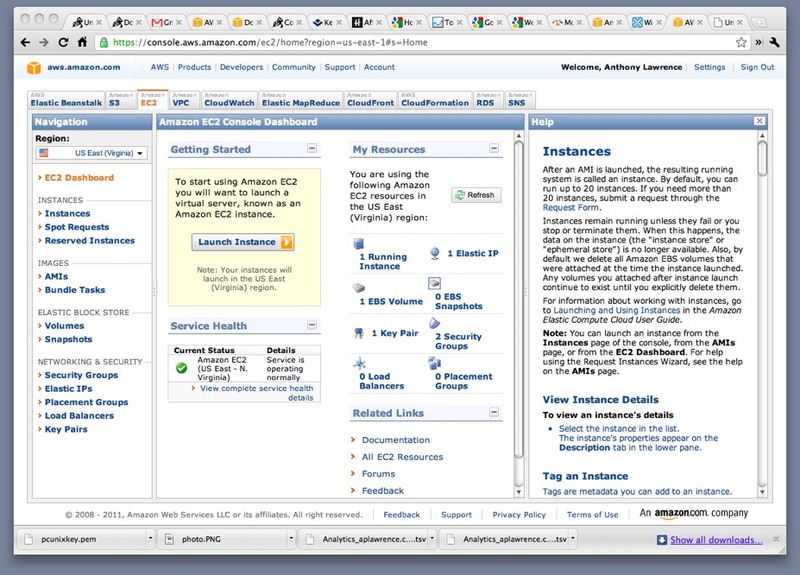 Sign in to the control panel - that will vary by your geographic location, but for me it is https://console.aws.amazon.com/ec2/home?region=us-east-1#s=Home. Choose your poison (you need to pick one of the *starred* instances to be eligible for the free year). Once you do that, Amazon provisions the (virtualized) server and sends you email when it is ready. It will have also created a firewall rule that allows you to ssh with a key - you'll get that key shortly. Once the instance is ready, you can start it up and assign a static IP to it.. Amazon calls this an "Elastic" IP because you can quickly assign it to another instance if you need or want to. "mykeyfile.pem" will actually be whatever name you gave it when you created it. You'll need to use "ec2-user" until you create other users later. You'll be logged in. Issue a quick "sudo su -" and you are root. You'll next install your software of choice. I did "yum install httpd", did some editing of httpd.conf, threw some files into the /var/www directory (using "scp -i mykeyfile.pem ec2-user@my-elastic-ip:") and did an "httpd -k start". The webserver can't be accessed until you add a firewall rule back at the EC2 dashboard, but once that's done, the webserver is up and running. Yes, it really is that quick. One thing you do NOT want to do is trust much of what you read on the web about AWS. You'll find plenty of pages that tell you that you can only serve static pages - no dynamic content. That was true before you could install these server instances, but obviously is not true now. I am considering transferring this site to AWS. Certainly there are pros and cons - perhaps we'll look into some of those in the next post. I'd save a few hundred dollars the first year, and it certainly gives me back the flexibility and control that I lost when moving to shared hosting. which is a reasonable piece of documentation - once you find it! Could you provide links to the screen shots as larger images so that I can click on the images? I'd like to see what the choices are but the images are too small. Thanks and nice article, quite useful! Yes, sorry - I often forget to do that. It is done now.